The first thing you must remember is that to get a solid mix of a song, the recording must be good to begin with with no distortion and enough volume to work with. It is vital to get a clean recording because mixing cannot fix badly recorded tracks so take this advice! When recording a track whether it is a vocal or instrument be sure to record as loud as you can but adjust the gain so it does not hit the red area and distort. You may not be able to hear distortion initially but you will after it is recorded. 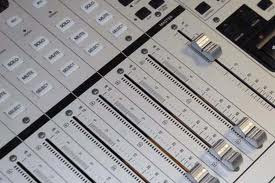 If you are running vocals or instruments through a few pieces of equipment such as a keyboard is going through a mixer to a compressor and back out to an input for your DAW then make sure the gain is set correctly on each of those devices so there is no distortion along the way. For vocals it would be something like mic-pre to a compressor to an input to your DAW. Once you have great sounding tracks that are clean then you are ready to mix. One method is to put all the levels at 0 and slowly bring the levels up one by one to what sounds good. I would start with drums, then instruments and then vocals to get the perfect blend. Once you think you have a good sounding mix then burn a copy of it to CD and listen to it in different devices. Try your car, through computer speakers, a boombox, in headphones ect. Take notes on what sounds good and what needs to be adjusted and then go back to mixing and fix what you do not like about the mix. Then repeat until you feel you have the perfect sound. Good Luck!